WusikGrooveBox, Virtual Drum/Percussion from Wusik. 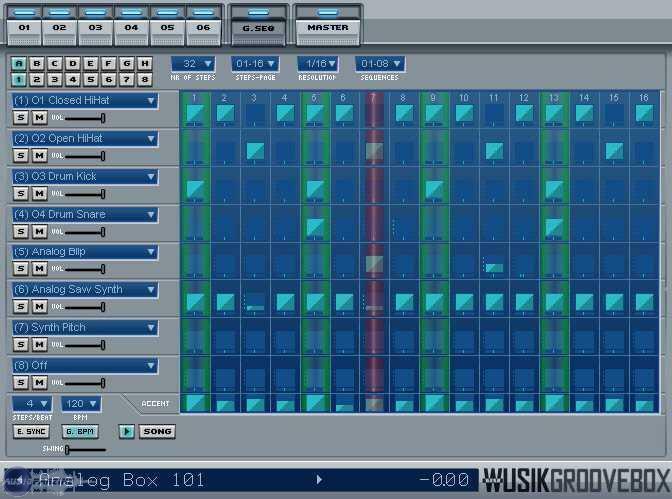 WusikGrooveBox VSTi is a drum-machine and groove-box solution based on the same audio-engine as Wusikstation, with WusikSND support and all the Wusikstation effects. Right now the product comes with only the Drumillenium set that has 103 SoundSets for a compressed size of 26 Meg. Wusik are also working on a complete manual, in the meanwhile, you can check the special Tutorial Videos they have created, and also the Wusikstation manual. 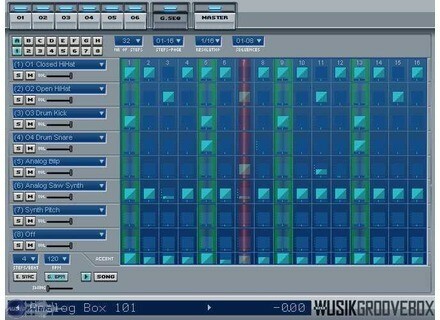 As WusikGrooveBox is based on the same engine as Wusikstation, most features are exactly the same. - VSTi Synth based on the WusikEngine: 6 single Osc Layers, each layer with its own set of Filters and EQs. - Extra options for the WusikSND format: Stereo-Pan (for mono sounds) and Choke-groups. This is accessible via the sample-editor and used only by the WusikGrooveBox. - 8 Sequences on the screen, with a two-page-selector for a total of 16 Sequences. - Each Sequence has 16 steps on the screen. Each step can be a drum-trigger and note-sequence. (each Sequence has an option of Drum or Note steps) A total of 64 steps can be set for each pattern, by using multiple 16-step windows. - 8 Banks of 8 Patterns for a total of 64 Patterns per instance. - Song mode, where you put the order of the patterns to be played. With option to Repeat Patterns and Loop the whole Song. - Each pattern has its own number of steps. To allow the creation of uneven patterns. Up to 64 Steps. - Each Step has an option of 8 levels of Velocity (volume). This is optional, you can also use the Accent Part instead. For easier and quicker groove creation. - A 9th Sequence on the screen, that holds the ACCENT sequence. This is OPTIONAL, as you can also set the volume of each Step manually. Or you can use this global ACCENT (volume) setting that will affect all sequences. - Each Step has a SHIFT option, so you can add early/late steps directly without having to change the resolution (internally all steps are based on a 1/128 resolution). - Each Step has FLAM option. - Each Step has a Slide and Note-Off option, for complex Bass/Synth lines. - You can control the steps by using the Mouse, PC or MIDI keyboard. - You can trigger patterns remotely by using the MIDI keyboard. With 3 modes: Off, Instant and Delayed. - Global BPM Tempo or Per-Pattern Tempos. So you can do tempo changes on a Song. It costs $ 49.95 USD and comes with the Drumillenium set of sounds. Wusikstation V5 users can cross-grade for only $ 29.95 USD, and receive a special Wusikstation V5 GBox version that has WusikGrooveBox integrated. This helps users who already have tons of sounds that can be used with WGBox directly without having to copy files around. Indamixx & energyXT XT Software AS has signed an agreement with Trinity Audio Group Inc to integrate energyXT Indamixx Version, a Digital Audio Workstation, with Indamixx, a handheld and portable Linux studio based on Samsung Q1 Ultra. Infrasonic Analogue Processes v1 Designed for electronic music producers, composers, and laptop DJs and performers, Infrasonik's sample packs are constructed to maximise the features of Ableton Live and Kontakt.